It took 2 weeks but its a far better and more informative review for the extra time spent researching such a complex new camcorder. The Panasonic AJ-PX270 is a joy to film with and having 10bit 422 really makes the pictures stand out. Watching the review which is a massive 19mins long you will learn the camcorders most inner secret which I will talk about later on this week but till then watch the review and be amazed. Note : FCPX was due to be updated around NAB 2014 because it won’t recognise AVC LongG as yet which means filming in 1280 x 720p till Apple get their act together. The video has been updated to show the difference between AVC i and AVC LongG it looks like AVC I has more sharpening going on. Thanks for the great review Philip! Very informative as always. Playing with the camera a bit at NAB I was very impressed as well. The variable zoom goes as fast as a few seconds all the way down to as slow as 3 full minutes from full wide to full telephoto. The focus assist options and superb LCD and EVF were also nice especially when full telephoto where you actually might have shallower DOF if your subject is closer. It was hard to gauge the low light performance and dynamic range of this camera but I’ve read that it’s a stop faster than the HPX250 and close to 12 stops of dynamic range according to a Panasonic rep. That would be impressive. However, watching your low light section it’s hard to tell how other cameras would handle that environment as well. I suppose it would have been nice to see some comparison footage. It did look great at 0db even up to the +12db shot, but I’d love to have seen how it compared in low light to the other cameras you mentioned you had in your review (EX3 & NX5). Do you have any comments about that? Always appreciate your reviews. In a world where DSLRs get 100 reviews on day one of release, it’s hard to find one good solid review of a smaller sensor camera…even a breakthrough camera like this one. It’s too bad you couldn’t shoot at 1080p. Argh FCPX! My second question is really to verify/confirm what I’ve understood from talking to reps at NAB…that one can use any old class 10 SDHC card with this camera and still shoot 1080p60 using the LongG25 codec? I read that it would shoot 1080p50/60 using LongG25 (which at that resolution/frame rate would double the bit rate to 50Mbps) for that setting. Is that correct? 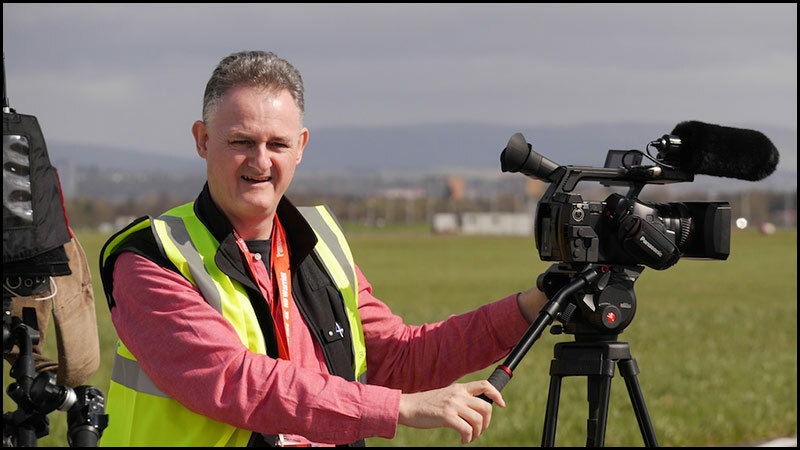 HDW : Have a look at my Sony HXR-NX3 review Allen filmed similar “Low Light” shots from the opposite side of the River Clyde, I have Premiere Pro CC loaded but don’t rate it as an editing platform. It will film 1080 50/60p onto SDHC cards (Class 10). AVC Intra 100 looks noisy compared to AVC LongG 50 even Panasonic admit this, remember I100 is an old codec these days. Grat review, once again Philip. The AJ- PX 270 is really a cracking camcorder! Now I am considering two Pannys, the GH4 and PX 270. Would that make a great pair? HDW : The GH4 is an exiting prospect I have 2 on order, the PX270 would work well beside a GH4. I’ve been waiting for this review. Thanks for the work that you put into it. I’m surprised you didn’t compare it to your go to run-n-gun JVC 650. HDW : Hi Gerald to be onset its not about one make against another plus the PX270 kicks the pants off any 8bit 420 camcorder I did film my wife mowing the lawn with both cameras 2 weeks ago and the extra detail in the 10bit picture was very convincing. I looked the camera at NAB but the way they had it set up it didn’t allow us to play much with it. The picture looked noisy to me in the mids but that could have been the monitor. The Sony PMW200 looked to me to handle contrast and highlights much better. I would love to see a comparison between an EX1, 3, pmw200 etc. in low light (not outside but under lower lit room or church) I would also like to see it against the AC160 which I own as well and is the camera I am looking to replace. (I think you own one?) I have been happy with the 160 when it is outside but indoors I have never been happy. Hi Philip, thank you so much for the review. Question… Does the PX270 have “Flash Band Compensation”?. I noticed the partially exposed frame at 7:18. That is my main pet peeve about the new generation of “Professional Camcorders”. Hopefully we will see more cameras with global shutter coming to the market; like the Sony F55 and Blackmagic Production Camera. I think the closest competitor to the PX270 is going to be the just announced Sony PMW-X180. They both have similar features (1/3 imagers) and price. Can’t wait for a comparison review of these two. HDW : The PX270 does have FBC you can choose it as one of the user buttons, I forgot to use it during the press day. Philip can you expand a little why AVC-ULTRA 100 was disappointing? It’s their prime codec on this camera! This is not good. HDW : 10bit is way forward its not difficult to choose. I’m torn between Ac130 or PX270. I learned on a HVX200 so I am buying a Panasonic, not DSLR. I will be filming indie films in small rooms, and documentaries on location. SDI out, Audio, PAL/NTSC I don’t need. I was thinking get the 130 then in 3 years get a 4K(8K?) ‘RED’ camera. I also want the best shot I can get now. However sometimes its the cameraman not the camera. For indie films is the AJ-PX270 maybe overkill? Congratulations for your work and thank you for your information. Recently I have use for a documentary the Panasonic AJ-PX270, but Final Cut Pro 7 does not recognize the format of recording (Long-gop25 60p). I can not find the right drive! HDW : FCP-7 will never recognise Long GOP25 the only way to get your material into FCP-7 is to ingest it via the camera itself from the SDI output. You will need to have a Matrox MX02 or Blackmagic card with an SDI breakout box to do this. Philip which camera would you purchase the AJ-PX270 or the Sony PXW-X180 and why? HDW : I have not seen the PXW-X180 so I can’t compare. You want to be an indie filmmaker but think you don’t need 60hz based frame rates ? BTW the use of terms PAL & NTSC is entirely inappropriate. 50hz and 60hz and to be even more accurate when discussing a PANASONIC camera and many SONY models too the choice is between 59:94hz and 50hz as all international and US standards need to be 59:94hz based for DVD, BLURAY and transmission compatibility. I prefer to shoot 59:94i (interlaced) at the highest in-card bit-rate in the case of the 270 …100mbps then either edit at 59:94 or if there is mixed footage from different cameras with some round number 30 or 60 fps convert all the rushes to 29:97fps or edit at 59:94fps then output a 29:97fps master for ALL AREA BLURAY and ALL REGION DVD. It also looks amazing projected off either an MPEG 2 BD-R DL or a ProRes file. Obviously you can also choose to shoot on the 270 at the cinema centric 23:98p that you will find in the 59:94hz section and the “24p” (really 23:98) gives a capture that is even less compressed and post houses can output from that to any world standard. I shoot prefer pushing the frame rate envelope Doug Trumball style. I don’t shoot rounded 60p as this will force more compression than 59:94i.